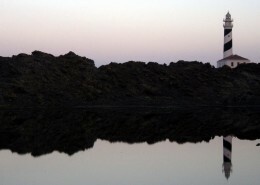 Menorca has been declared Biosphere Reserve. It provides an excellent natural area for the practice of outdoor activities. Its landscape, geography and environment are undoubtedly the ideal place to relax, forget the stress and let the peace, quietness and pleasure of the simple things transport you to another dimension. Its pristine beaches, the constant changes of its landscape and its unique geological diversity plus its characteristic flora and fauna, make this ancient island in the western Mediterranean a pearl for sea kayaking enthusiasts and a paradise for nature lovers. A kayak is an ancient boat used for hunting by the Inuit culture and a key item to the survival of those natives from the Arctic areas of Alaska and Greenland. It was introduced in Europe in the nineteenth century and after some time it was adapted as a leisure boat and began to be used for touring expeditions. 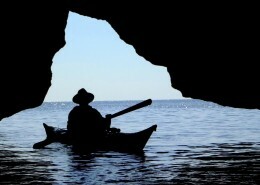 Within canoeing, sea kayaking is the most adventuress discipline and the one that provides a closer contact with nature. The practice of this sport combines knowledge of navigation, orientation and survival and requires a strong team spirit, and passion and interest for travel and exploration. The kayaks used in this discipline are very similar to those originally used by the Inuit. Its structure is long and addressable so you can cover long distances to low performance. 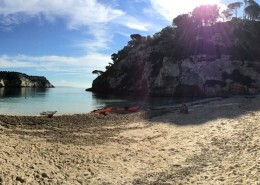 The essence of our project is to sea kayaking as a means to discover the splendor of Menorca, explore all its coastline and its most inaccessible corners at a leisurely pace, stopping at hidden beaches and unknown coves and be in peace with nature. 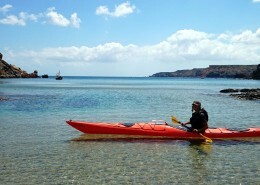 One of the biggest attractions of the island is its coastline and a sea kayak allows to enjoy it as never before. And for those looking for exciting challenges, what better than completing the circumnavigation of the island? 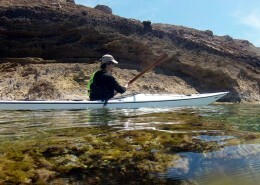 Karetta Expeditions offers different types of expeditions intended for each one of you so that every one finds a way to experience sea kayaking in Menorca that best suits your condition. Come discover it with Karetta Expeditions!